MakeShop Review 2019: Is MakeShop a Good Hosting? MakeShop is a Korean hosting brand that focuses on building e-commerce stores. They offer a huge variety of e-commerce features and have servers located around the world. Korean company Korea Center, the maker of ‘MakeShop’, was founded in 2000. Rather than being a pure website hosting provider, their focus is much more on the provision of online e-commerce stores. This company has grown from serving just Korea in 2000, to incorporating Japan and America by 2009, and then adding Germany and China by 2013. They have 500 local staff, 300 international staff, and multiple worldwide locations. Their website is in Korean. As will already be apparent, MakeShop’s unique selling proposition is their total dedication to e-commerce. They offer readymade store templates, an integrated checkout, reports for order analytics, mobile shopping functionality, and e-commerce marketing services. MakeShop’s prices seem quite expensive when compared to regular hosting companies, but they’re not a regular hosting company. For example, they shout about the fact that they provide for free what other companies charge for: an e-commerce payments system, mobile shop apps, and e-commerce consultancy/education. You need to add the cost of a domain onto their prices, but as you might expect from a company focused on e-commerce: SSL certificates are free. They offer a 30-day free trial on some packages, and three months free trial of their store templates. The checkout process is quite confusing if (like me) you’re not Korean, but it begins by first asking you choose whether you are an individual, business, or bigger enterprise. You are then presented with their terms and conditions, which you must accept before moving on. You can call the MakeShop Customer Center on weekdays between 9.30am and 6.30pm, but not during weekends or holidays. You can even fax them; if you still have this old technology still lying around somewhere. 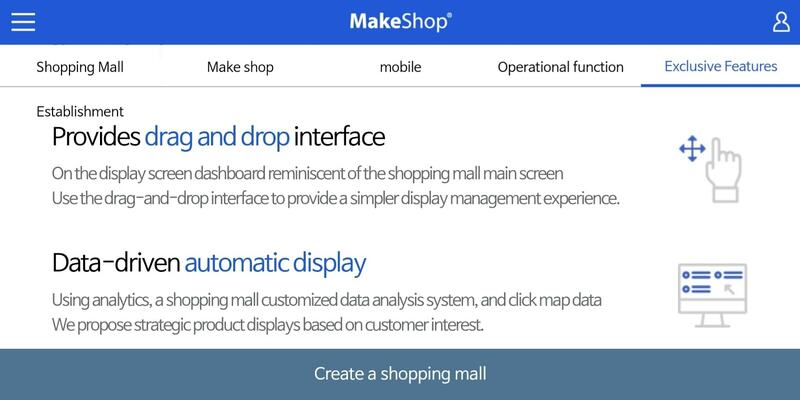 MakeShop also seems to commit to educating its e-commerce customers through a range of initiatives. If you’re looking to do e-commerce in Korea or from Korea, MakeShop may fit your brief exactly. If you’re looking for more general web hosting, this is probably not the provider you’re looking for. Wondering how MakeShop stacks up against other Web Hosting companies? Enter any other Web Hosting company and we will give you a side-by-side comparison.